CARFAX Certified 1 Owner - No Accidents - Fully Serviced - QUALITY CERTIFIED up to 10 YEARS 100,000 MILE WARRANTY This Land Rover includes: FUJI WHITE ALMOND/ESPRESSO, LEATHER SEAT TRIM Leather Seats WHEELS: 19 ALLOY Tires - Front Performance Aluminum Wheels Tires - Rear Performance *Note - For third party subscriptions or services, please contact the dealer for more information. * Enjoy an extra level of calm when purchasing this Land Rover Range Rover Evoque Pure Plus, it's a CARFAX One-Owner. The CARFAX report shows everything you need to know to confidently make your pre-owned purchase. With this exceptional SUV, you'll get sport, utility, and comfort. For those who are ready to drive something more than just a car, this Land Rover Range Rover Evoque Pure Plus will appeal to their idea of luxury and refinement. Simply put, this Four Wheel Drive is engineered with higher standards. Enjoy improved steering, superior acceleration, and increased stability and safety while driving this 4WD Land Rover Range Rover Evoque Pure Plus. The Range Rover Evoque Pure Plus is well maintained and has just 47,870mi. This low amount of miles makes this vehicle incomparable to the competition. Added comfort with contemporary style is the leather interior to heighten the quality and craftsmanship for the Land Rover Range Rover Evoque With all records included, feel comfortable knowing that the history of this Land Rover Range Rover Evoque Pure Plus is provided in order for you to make a knowledgeable decision. Looking for a Land Rover Range Rover Evoque that is in great condition inside and out? Take a look at this beauty. Well-equipped, well-cared for and still covered under the manufacter's factory warranty. Fast and exciting, this Land Rover Range Rover Evoque Pure Plus is a true testament to the pursuit of automotive distinction by Land Rover. Once you're behind the wheel of this incredible machine, you will not think twice about purchasing this vehicle. Class defining, one-of-a-kind options are the standard with this Land Rover Range Rover Evoque plus much, much more. Time is money, and thanks to the navigation system on this Land Rover Range Rover Evoque, you'll be spending a whole lot less time getting to your destination. The brand new set of tires means that you will be able to drive off the lot without hesitation. You can drive off in the Land Rover Range Rover Evoque Pure Plus feeling safe and confident with these new tires. This Land Rover Range Rover Evoque Pure Plus has a flawless finish that complements its wonderful interior. This rare vehicle is a prime example of automotive engineering perfected. Upgraded wheels enhance the look of this Land Rover Range Rover Evoque. More information about the 2015 Land Rover Range Rover Evoque: The Range Rover brand is known for go-anywhere vehicles that provide a healthy amount of both luxury and technology. The Evoque is no tarmac-only off-road imposter -- Haldex all-wheel drive is standard, with several electronic settings for a variety of conditions, and power comes from a 2.0L turbo inline 4-cylinder engine that makes 251 lb-ft of torque. Compared to the Audi Q5, Volvo XC60 and BMW X3, the Evoque is a strong contender with a look all its own. Interesting features of this model are Rugged looks, fuel efficient turbo engine, capable all-wheel-drive system, 2- and 4-door configurations No Credit / Bad Credit / No Paystubs, No problem !! ! All Approved ! Everyone drives ! CLEAN, GORGEOUS, LOW MILES, SHOWROOM CONDITION. CALL NOW QUALITY CERTIFIED up to 10 YEARS 100,000 MILE WARRANTY , To Certify a vehicle, there will be an additional cost for Certification. CALL NOW For details. STUNNING AGGRESSIVE LOOK ON THIS BEAUTIFUL--Call today to schedule a test drive... Good Credit/Bad Credit/No problem!!!! Get paid cash? No problem!! 100% Credit Approval with interest rates starting at 2.49% for qualified customers, our rates will not be beaten. We price our cars at wholesale price to guarantee the best deals for our customers. Our inventory moves quick, please call to confirm the availability of the vehicle of your interest Springfield location 973-564-0112. This vehicle is located at our SPRINGFIELD location. Come visit our new showroom in Springfield NJ. 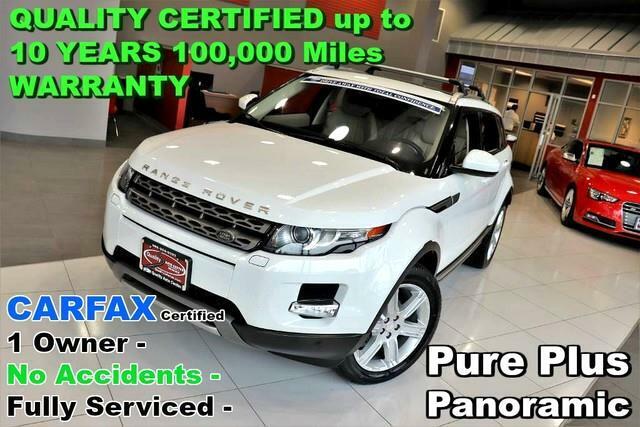 This 2015 Land Rover Range Rover Evoque Pure Plus is proudly offered by Quality Auto Center Perfect for the on-the-go family, this Land Rover Range Rover Evoque Pure Plus is an SUV everyone will love. With exceptional mileage, options and power, you'll insist on driving it on all your outings. Excellence, luxury and stature are just a few of the pillars this car is built upon. This 4WD-equipped vehicle will handle beautifully on any terrain and in any weather condition your may find yourself in. The benefits of driving a 4 wheel drive vehicle, such as this Land Rover Range Rover Evoque Pure Plus, include superior acceleration, improved steering, and increased traction and stability. This vehicle has extremely low mileage on the odometer, so while it's pre-owned, it's practically new. More information about the 2015 Land Rover Range Rover Evoque: The Range Rover brand is known for go-anywhere vehicles that provide a healthy amount of both luxury and technology. The Evoque is no tarmac-only off-road imposter -- Haldex all-wheel drive is standard, with several electronic settings for a variety of conditions, and power comes from a 2.0L turbo inline 4-cylinder engine that makes 251 lb-ft of torque. Compared to the Audi Q5, Volvo XC60 and BMW X3, the Evoque is a strong contender with a look all its own. This model sets itself apart with Rugged looks, fuel efficient turbo engine, capable all-wheel-drive system, 2- and 4-door configurations No Credit / Bad Credit / No Paystubs, No problem !! ! All Approved ! Everyone drives ! CLEAN, GORGEOUS, LOW MILES, SHOWROOM CONDITION. CALL NOW QUALITY CERTIFIED up to 10 YEARS 100,000 MILE WARRANTY , To Certify a vehicle, there will be an additional cost for Certification. CALL NOW For details. STUNNING AGGRESSIVE LOOK ON THIS BEAUTIFUL--Call today to schedule a test drive... Good Credit/Bad Credit/No problem!!!! Get paid cash? No problem!! 100% Credit Approval with interest rates starting at 2.49% for qualified customers, our rates will not be beaten. We price our cars at wholesale price to guarantee the best deals for our customers. Our inventory moves quick, please call to confirm the availability of the vehicle of your interest Springfield location 973-564-0112. This vehicle is located at our SPRINGFIELD location. Come visit our new showroom in Springfield NJ.